(UPDATED! See latest after jump.) Hey, haven’t we seen this guy before? 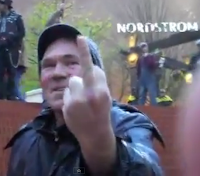 That man who spit on the cop over the weekend at another illegal “Occupy” event looks awfully familiar. Oh, yes, now we remember where we’ve seen the Occupy Portland, ISO, socialist, rabble rouser…etc, etc, etc, before. Citizen Journalist, Daylight Disinfectant, warned Mayor Sam Adams about this lunatic last spring. 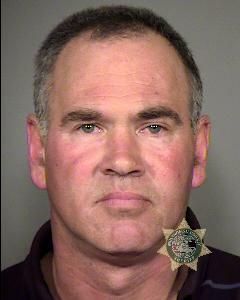 Today, Sunday December 18, 2011, at approximately 3:45 p.m., Portland Police officers assigned to Central Precinct arrested 46-year-old Richard Hernandez after he spit in the face of a security guard at Pioneer Place. Hernandez was participating in an Occupy Portland related march which started at approximately 2:00 p.m. at Shemanski Park in the South Park Blocks.Hernandez was charged with Resist Arrest, Harassment and Interfering with a Police Officer and booked into the Multnomah County Jail. Richard and the racist, homophobic friends he brought with him to attempt to drown out the legal, permitted, and perfectly peaceful Tea Party last April 15th were agent provocateurs. They brought with them their ILLEGAL noise makers and tried to drown us out. Nice touch–what do you call yourselves this week? –oh yes, Occupiers. Look at the unhinged Richard below. He even made national news. 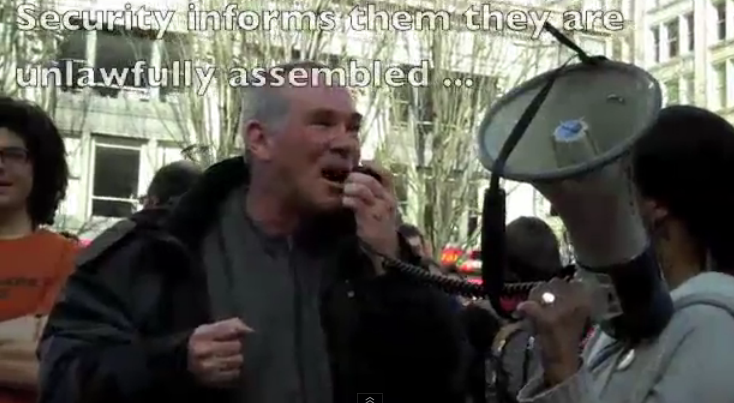 Here he is again in March with his IWW and Jobs with Justice buddies at another event. March 2011. Same people, new name. In this video by Daylight Disinfectant, we see them calling for violence. To reitterate what I’ve said from DAY ONE: The Occupy people are the same people who have been hiking out on the fringe left. They are the same people. Same people. Same. Occupy is just a new name with more money infused from the unions. See Scott St.Clair’s piece nearby if you don’t believe me. Do you think you could make it in retirement on $20K/month? 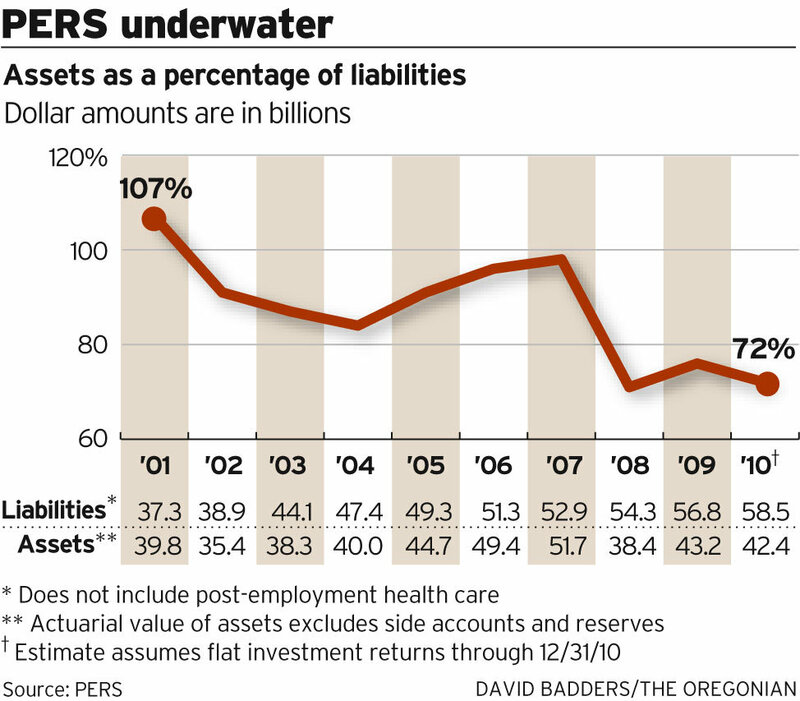 That’s how much former OHSU Chief Peter Kohler is getting from the taxpayers of Oregon. You’ve heard about former UO coach Mike Bellotti making approximately a half mil a year and now we find out in this Statesman Journal piece (here) that 60% of the big time payouts of PERS are going to folks in higher ed. I don’t begrudge anyone getting what they can as long as it’s legal, but 60% of the big time payouts going to former professors? Hey Occupiers, over HERE! You’ve seen the signs and complaints by the Occupiers that high student loans are one of their major beefs. Well, it seems to me that the Occupiers are missing the boat. Instead of agitating for higher pay for union members as their union pay masters insist they do, if they’re REALLY upset about their unsustainable student loans they might want to take a look at the PERS set up. 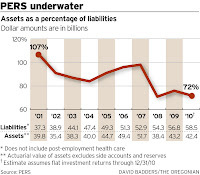 Overall, PERS costs are having an effect on the Oregon University System’s budget, just as they are affecting the budgets of state agencies, cities, counties and school districts. Nearly half or more of this year’s tuition increases at the seven state colleges can be attributed to rising PERS employer rates, Kenton told state lawmakers earlier this year. During a March hearing, Kenton told legislators that PERS rate increases would require a 4 percent tuition increase to cover the additional costs. Wow, and that’s just THIS YEAR! That’s where the money’s going, kids. Unsustainable spending. The gift that keeps on giving. Hey Occupiers: Over HERE. 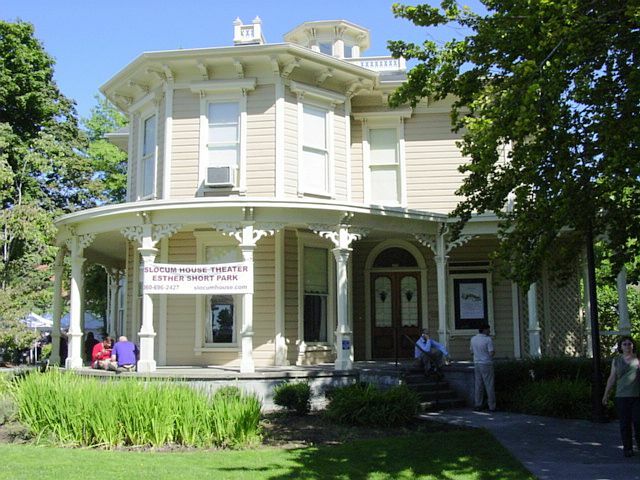 For the past 45 years, Slocum House Theater has been performing community plays in the renovated Italianate villa style home since it was saved from the wrecking ball and moved to its current location in Esther Short Park by volunteers of the Old Slocum House Company in 1966. Volunteers of the Old Slocum House Theater Company with cooperation from the Fort Vancouver Historical Society accomplished the renovation of the then century old home in 1972. Money was raised for the project by presenting plays and manning an automobile license station. Currently, the Theater shares the building with the Farmers Market, who maintains an office upstairs. The Non-Profit Theater Company leases the home from the City of Vancouver, paying $635 a month with the City responsible for repairs to the building, an arrangement that has been beneficial to the community for many years and charges a general admission price of $13 for a play, $11 for seniors and children 12 an under. We also know that the city, struggling during this continuing “Great Recession” is experiencing budgetary problems. Some are of their own making many feel and some due to the depressed economy. Everywhere we seem to look, taxes and fees are being raised to cover the expenses of the city and to continue pursuing expensive projects many citizens feel are unnecessary. I can only imagine the shock felt by the Slocum House Theater Board, realizing their lease expires December 31, 2011 when they recently received a draft agreement proposal from the city informing them that their monthly rental fee is to be increased by 400%, from the current $635 a month to $2500 a month! I do not know just who at the city wrote the draft or decided that the rent must be raised to such an astronomical amount, but the draft has signature blocks for City Manager Eric Holmes, who just received a very nice pay increase that even the Columbian questions during these economic times, as well as the city clerk and the city attorney. Bear in mind that Holmes’ wages being increased to $167,152 annually (plus benefits) or his deserving such an increase at this time has no direct bearing on this issue. 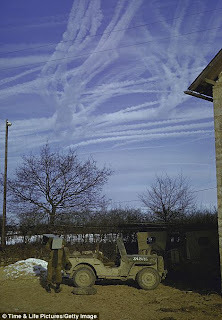 It only indicates some of the ways our tax dollars are being spent currently. In 2 meetings held earlier this year with the city, the Theater was informed they could expect a “small” increase, the city desiring to achieve “market value” gradually over a few years. A 400% increase to a community oriented non-profit with 2 weeks notice is not my idea of gradual or small. The city has claimed an expense of $30,000 a year spent on Slocum House and I am waiting on a breakdown of those expenses, hopefully sometime this week. The Theater Company has agreed to take over the utilities and insurance and has been told they could rent the building out for special events to help increase funding to cover expenses. The “ongoing discussion over much of this year” amounts to 2 meetings. I concur with looking over all expenses in these dark economic times. But, I am also reminded of this same city council recently granting a Millionaire Developer a tax abatement amounting to over $1 Million and their ability to come up with $250,000 in hopes of the construction of yet another park, while many of the others parks around the city wilt away from lack of funding, neighborhood volunteers also being prevented from performing the needed maintenance themselves. I am also reminded of the overly ambitious pursuit of a Waterfront Development and transportation projects that could drive many citizens and businesses towards bankruptcy. This might seem odd coming from a pro-business conservative, but even we have a sense of community. The Slocum House Community Theater has served the community for over 45 years now. Such plays and events as they host not only provides citizens with entertainment, but it gives citizens within the community with an artistic talent an outlet within the community to utilize their talents. The City Council would be wise to preserve this historic landmark and initiate a more reasonable lease agreement with the Theater Company allowing them to continue serving our community. I urge Clark County residents and all others to read the appeal to the community from Slocum House Theater and contact the mayor and each city council member, expressing support for Slocum House Theater and not to evict them from Slocum House. 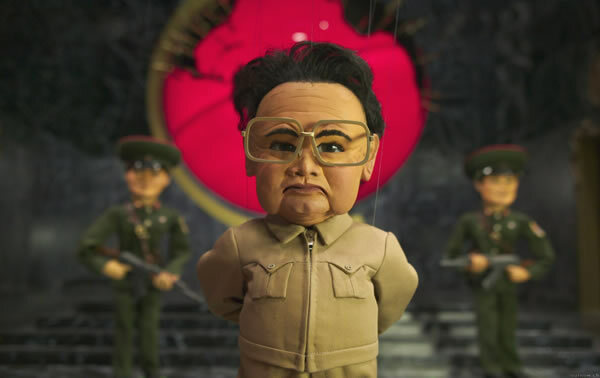 CNN Reports, North Korean Dicator Kim Jong Il has Died. Updates to follow as more word is released. The BBC’s Lucy Williamson in Seoul says his death will cause huge shock waves across North Korea. “Kim is believed to have suffered a stroke in 2008 but appeared relatively vigorous in photos and video from recent trips to China and Russia and in numerous trips around the country carefully documented by state media.